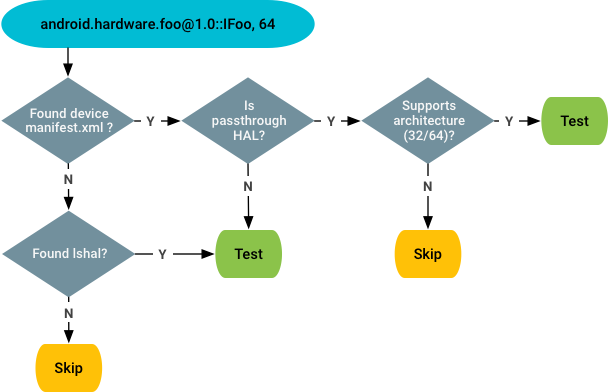 The Android 9 Vendor Test Suite (VTS) supports a runtime method for using the device configuration to identify which VTS tests should be skipped for that device target. If a specific device does not support a testing HAL (e.g. IR), VTS does not need to run tests for that HAL test against that device target. If several devices share the same SoC and vendor image but have different hardware functionalities, VTS must determine whether a test should be run or be skipped for a specific device target. Compliance tests ensure compatibility between framework and vendor partitions. These tests are required to be run (and pass) on devices launching with Android 8.0 or higher. Non-compliance tests help vendors to improve product quality (performance/fuzzing etc.). These tests are optional for vendors. Whether a test is a compliance test or not depends on which plan it belongs to. Tests that run with VTS plan are considered compliance tests. The optional attribute indicates if the HAL is strictly required by the framework. The file may contain multiple entries for the same HAL (with same name) but with different version and interfaces. The file may contain multiple version configurations for the same entry, indicating the framework can work with different versions. version1.0-1 means the framework can work with the lowest version 1.0, and does not require a version higher than 1.1. If the file contains only a single version configuration for an entry, version1.2 means the vendor supports all versions from 1.0~1.2. The vts_testibility_checker is a binary packaged with VTS and used by VTS test framework at runtime to determine whether a given HAL test is testable or not. It is based on libvintf to load and parse the vendor manifest file and implements the decision flow described in the previous section. To determine which HALs are accessed by VTS tests, ensure that each HAL test uses the VtsHalHidlTargetTestEnvBase template to register the HAL(s) accessed in the test. The VTS testing framework can then extract the registered HALs when pre-processing the test.